This Halloween, do you harbor the sociopathic desire to convey to everyone you know and appreciate — once and for all — that you truly are a walking nightmare? 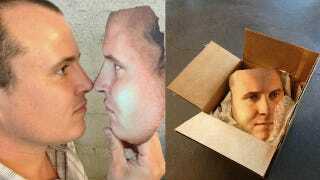 If so, why not make an unnerving 3D mask of your own face? That's exactly what a fellow at the 3D printing firm Cubify did. As Cubify explains on their blog, "Patrick scanned his face with a Planmeca ProMax 3D ProFace CAT scan machine from Finland (X-ray setting off, of course), and used a ZPrinter 650 to do a full-color print of his face." Now you can prove to your loved ones that the monster was walking among them all along. RELATED: Similar idea, but on the cheap.